Purpose made accessories for angle grinders and bench grinders for cleaning steel and other materials. 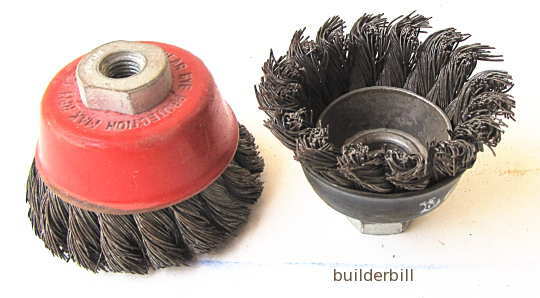 Above are two wire cup brushes for use in 100mm electric angle grinders. They come in varying sizes grades of wire. Heavy thick wire ones are suitable for removing heavy scale, rust, weld slag and spatter from steelwork. Others that have finer and softer wire are used on softer materials and for buffing. There is a different pattern available that is often used in bench grinders. Be aware that these wire brushes in any grinders often shed their wires and of course grit and material being worked on. Safety equipment must be worn. Personally apart from normal work gear I always use a full face mask, long sleeved leather welding gloves and a leather apron when using these power tool accessories. They do a mighty job, but don't let them spoil your day.